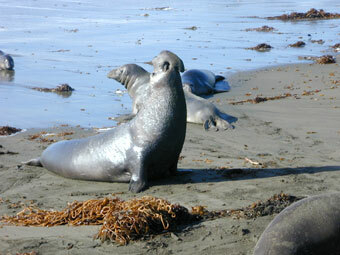 Elephant seals are thick bodied seals with rather short front flippers with protruding nails. 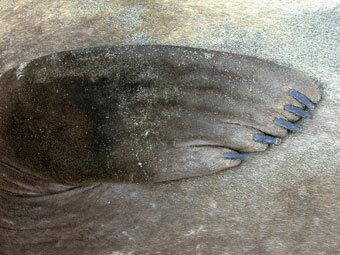 Their hind flippers cannot rotate forward, so, when they are on land, they must drag their hind limbs as they lumber across the rocks or beaches. 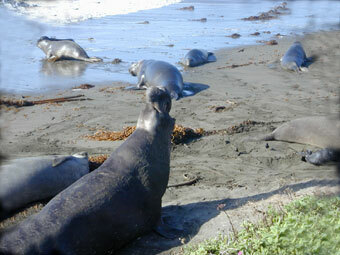 The hind flippers are fully webbed and function as excellent flippers when these seals are in the water. They are extraordinary swimmers, using primarily their hind flippers for propulsion and their front flippers as rudders for steering. 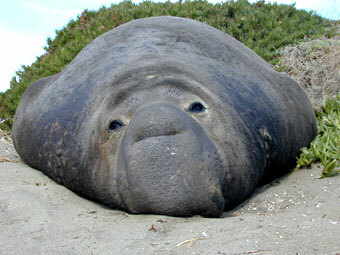 The difference between the sexes becomes extremely noticeable as elephant seals mature. 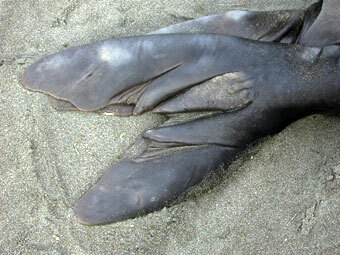 This is called sexual dimorphism and is very pronounced in the elephant seal. 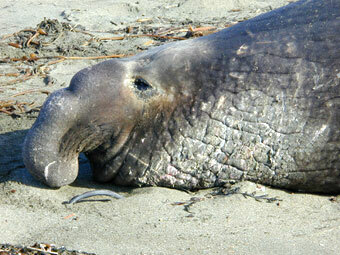 The nose of the male elephant seal elongates at puberty (7-8 years old) into an inflatable "proboscis." This is used during reproduction when the males establish territories. The territories are established by fighting - both physically (by lunging at each other) and vocally (using their large nose). By inflating the proboscis and vocalizing into it, a large male can use this to threaten other nearby males. This is done as the male rears up, holding its body up with its front flippers to the maximum height, throwing its head back and vocalizing a series of deep sounds called 'clap-threats.' Often, this threat posture and the sound is enough to make all other males retreat. 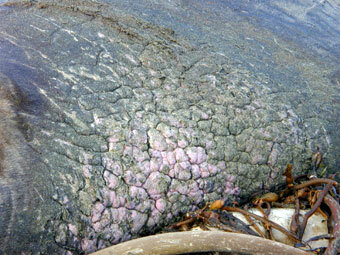 The older males develop a "cornified chest" - a thick calloused chest with numerous creases that is often pink, white and brown in color. This cornified chest is used in the physical fighting that goes on in the establishment of reproductive territories. 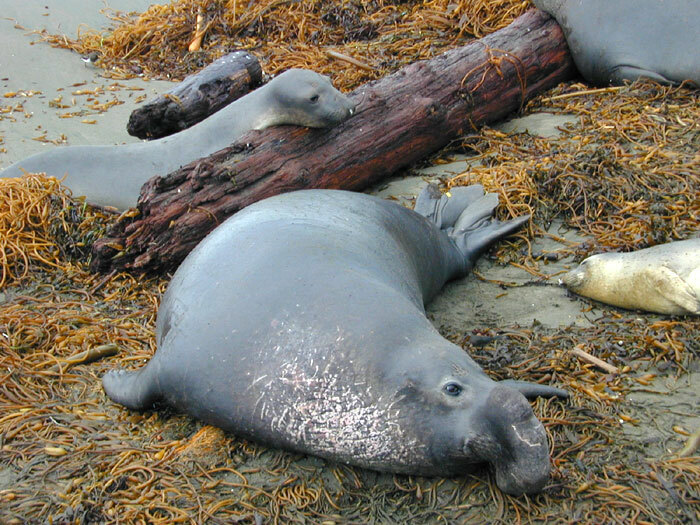 Male northern elephant seals can be over thirteen feet long, weigh over 4,400 pounds, and live over 14 years whereas southern elephant seal males can be over sixteen feet long, over 11,000 pounds, and live over 15 years. 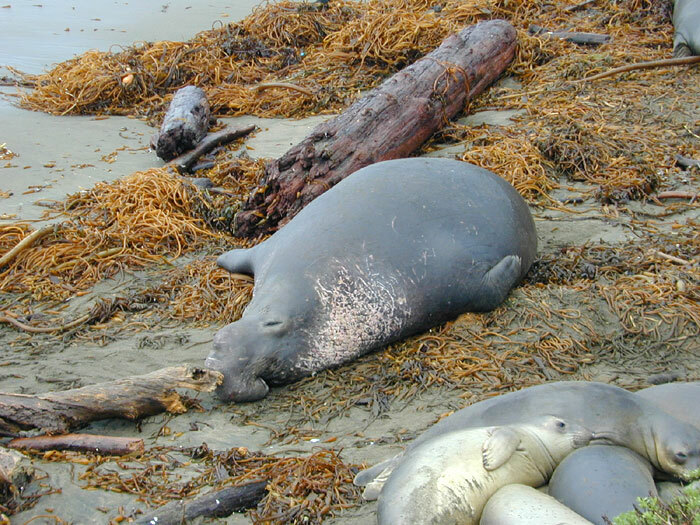 Female northern elephant seals can be over ten feet long, weigh over 1,300 pounds, and live over 20 years whereas southern elephant seal females may be over ten feet long, weight over 2,000 pounds, and be over 23 years. 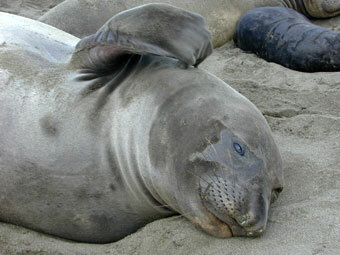 The color of elephant seals changes during their life and is due to their fur. All are born black and molt to a gray color at weaning. This gray color changes to various shades of brown or tan and they may be darker on their back than on their belly by the time they are several months old. Most older males are a dark brown whereas females range in color from various shades of brown to blond. 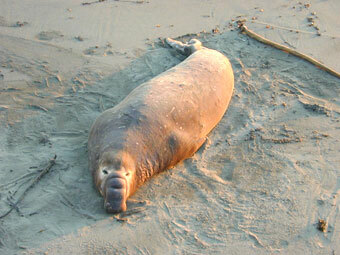 Elephant seals will migrate back to the beaches where they were born, each summer, and undergo a molt. 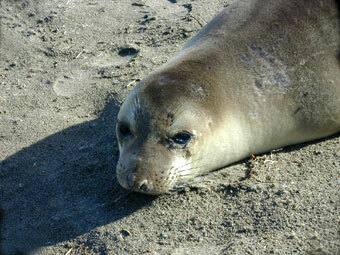 This molt is the shedding of large patches of their fur (and the top layer of their skin). They look particularly "moth eaten" during this time. 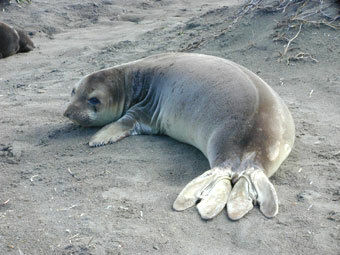 During molting they do not enter the water as they lack the insulation of their fur. 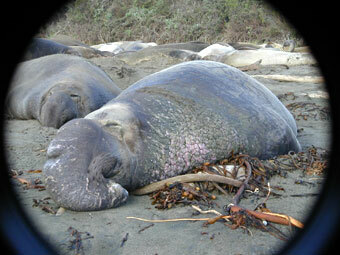 The elephant seals just sleep on the beach for the month it takes them to regrow their fur. During this time they do not feed as they may become chilled if they enter the cold water. 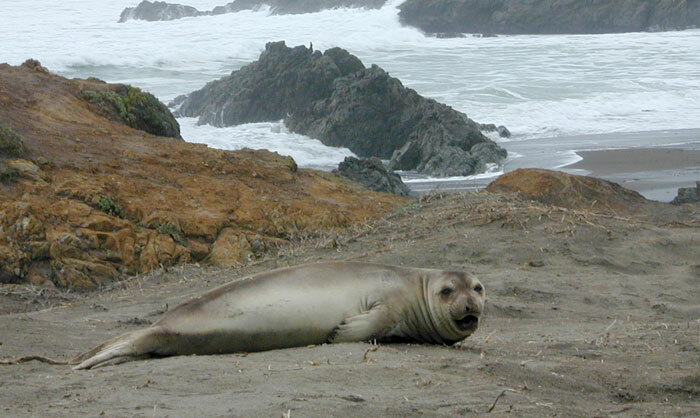 Although many seals may molt, it is only the elephant seals, monk seals, and maybe the Ross seals that lose so much fur and skin at one time in a "catastrophic" molt.